Hi ! How are you? Still a radio freak.Our website www.radiobatavia.tk was ‘off the air’ but we manage to get it back ! Please put it as a link on your site and tell your friends..! And ofcourse we will continue to make NICE free radio programs for you ! Atlantic 2000 will be on the air this Sunday 1st April, from 08:00 to 09:00 UTC (10:00 to 11:00 CEST) on 9480 kHz, and at the same time on our website. If you want to receive our QSL card, send a correct reception report including details about more than 15 minutes of programme. Atlantic 2000 sera sur les ondes ce dimanche 1er avril de 08:00 à 09:00 TUC (10:00 à 11:00 à Paris) sur 9480 kHz, et en streaming sur notre site Internet. Si vous souhaitez recevoir notre carte QSL, le rapport d'écoute que vous nous adressez doit comporter, en plus des conditions de réception, des informations précises sur le programme entendu. La durée d'écoute doit être supérieure ou égale à 15 minutes. Vous trouverez plus de détails sur notre site, rubrique "rapports d'écoute". This weekend there is a other dx special going on, there will be many pirates join this big event. The game is to reach as many continents as possible, 19 pirates have registerd them self to the Dx list. Loads of sstv pictures will be send out during the broadcast. Stations!!! Please mail me new frequencies and times in real time! I will update your info immedeately to this blog ! NEW FRQ'S AND TIMES WILL BE PUBLISHED HERE IN REAL TIME!!! Saturdaymorning 08:00 - 10:00 h utc. Saturday afternoon 14:00 (or 14:15) - 15:00 h utc. Sundaymorning 09:00 - 11:00 h utc. Frequency 15.050 - 15.065 MHz, if 15.060 is occupied. On Sunday starting at 09.00 utc. Short test was planned but cancelled for this weekend. No frequency or time information yet. WR is on the air every Sunday from 08.00 - 11.00 utc. let's hope it will be on air for this weekend. Sunday 1.4.2012 starting at 08.00 utc. Not 100 %. 21.500 or 21.850 MHz. Antenna tower still down for the winter. Saturday 14.00 - 16.00 utc. On air with "Sunday DX-special". Later exact times. Again new participant! More info later!! at 06.30 - 07.00 and 07.30 - 08.00 utc! Progamme will continue longer if possible. More exact frequency and times later, also 21 MHz is possible. 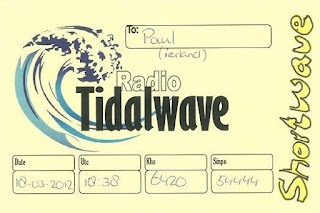 On Sunday 1/4/12 from 08:00 ..... 10:00 UTC on the Dipole intend for Scandinavia and the Mediterranean Sea. On Sunday 1/4/12 from 11:00 ..... 13:00 UTC on the Vertical ant. intend for overseas country,s . On air from 14.00 - 23.00 utc. took this in because it is special 10 W mobile!! 1) European MORNING 08.00 - 12.00 UTC from Europe to Asia/Japan/Oceania. 2) European AFTERNOON 12.00 - 16.00 utc from Europe to North America and vice versa. 3) European NIGHT 22.00 - 24.00 UTC from North America to Asia/Oceania. 6305-20.55 Cupid Radio Playing Men Without Hats"safety dance" And talking In Dutch. Strong Signal Sinpo 54444. 6960-19.25 Atlantic Radio(presumed) With A Mix Of Rap, Dance, Pop and Rock Music. Strong Signal Sinpo 54444. Different Program To the One on There Internet site. So, I changed the schedule to be one week later. New Balkan station will be on the air. 3) European NIGHT 22.00 - 24.00 UTC from North America to Asia/Oceania. NEW! 6300-17.30 Radio Flying Dutchman With ID Jingles And Polka Music. Also Thanking Everyone In Iann's Chat For There Reception Reports. Fair Signal Sinpo 43333. Close Down a Few Minutes Later. 6940-17.15 Laser Hot Hits Gary Drew With His Laser Goes Dx Program. Give A Mention To This Blog And Uk Dxers Blog. Many Thanks For The Plug Gary. Fair Signal Sinpo 34333. Is This Laser Using A New Frequency Or Somebody Relaying Them? 6296-17.13 Wizard Radio With A QSO For Radio Baken 16. Also talking about the clock going back next Sunday morning And playing A Strange Song From The Massive Wall Project. Strong Signal Sinpo 54444. Stations From The Uk are in coming here Generally with Good Signal these last couple Of Months. 6940-15.50 Trans Europe Radio playing Blondie"Marie". Fair To Good Signal Sinpo 44433. 6325-17,55 Radio Underground Steve Playing Dutch Music. Strong Signal Sinpo 54444. Has Steve Increase The Power Of His TX?. This is just a short note to let you know as per usual WR International will be on air live at 8:00 utc Sunday. 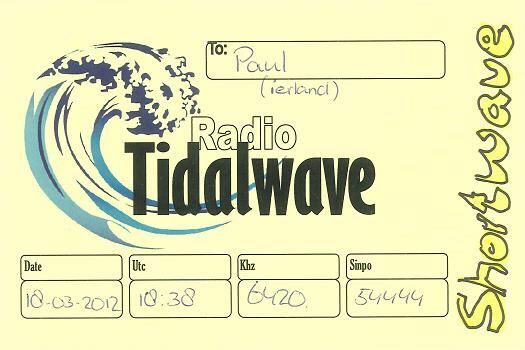 The difference this week is that we will also be on 15770 Khz. For those that have tried in the past to hear WR International and not managed it, this might be your chance. This little transmitter will be pushing us out with a massive 250Kw of power for one week only. Give it a try between 08:00 and 11:00 UTC Sunday 11th March 2012.
using for the first time a multi-band antenna. This antenna is optimized for the 41m band, but can also be used in the 31and 49 metre band. Tomorrow, we will test the operation of the antenna in the 31m band. In the Summertime 2012, MV Baltic Radio will also broadcast in the 49m band with 100 kW via Issoudun (France). Best 73s and good listening. Sunday March 11th 07:52- 14:03 UTC/ 08:52-15:03 CET the complete February 26th broadcast will be repeated on 7600//9300 kHz. 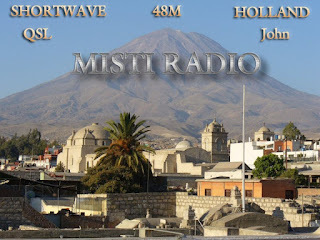 Wizard Radio's brand new MW Pirate Review for March 2012 is now available to download here. Het is Maart en het is tijd voor de meest recente MW piraten terugblik. Klik hier om editie nummer 8 te downloaden. 6295-18.15 Unid with Laser 558 Recordings. Charlie Wolf Behind The Mike. Strong Signal Sinpo 54444. This station was also heard last week on this frequency, Does Anybody know what the name of this station is? 6295- 18.18 Unid Playing a Rock Song From A Female Singer Or Band. Good Song, Pity The DJ did not name The Song. Strong Signal. Sinpo 54444. 6375-18.46 Polaris Radio Playing Rock Music And Talking. Good Signal Sinpo 44344. 6295-15.33 Unid With Laser 558 Recordings. playing Culture Club"karma chameleon". Good Signal Sinpo 43444.